In 1962, Dr. Joseph Carl Robnett Licklider formulated the earliest ideas of global networking in a series of memos discussing an “Intergalactic Computer Network.” Both well-liked and well-respected, he demonstrated an amazing prescience many times over. His original and far-sighted ideas outlined many of the features the Internet offers today: graphical computing, user-friendly interfaces, digital libraries, e-commerce, online banking, and cloud computing. 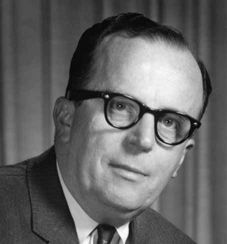 In 1963, while he was serving as director at the U.S. Department of Defense Advanced Research Projects Agency (ARPA), it was Dr. Licklider’s persuasive and detailed description of the challenges to establishing a time-sharing network of computers that ultimately led to the creation of the ARPAnet. His 1968 paper called “The Computer as a Communication Device” illustrated his vision of network applications and predicted the use of computer networks for communications. Until then, computers had generally been thought of as mathematical devices for speeding up computations. The ARPAnet was eventually eclipsed by the Internet, and in the same year that the ARPAnet formally shut down – 1990 – Dr. Licklider died at age 75.